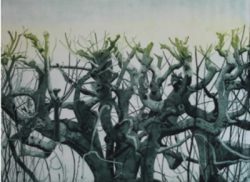 JONATHAN Garratt, one of the country’s leading potters, is back at Shaftesbury Arts Centre, from 7th to 20th November, in a joint show, Art Naturally, with printmaker Victoria Garland. 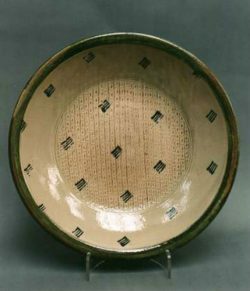 Jonathan, who has his pottery at Stour Row, is a renowned studio potter, but the great appeal of his work is that it is both functional and beautiful. You want to put a Jonathan Garratt bowl or platter on display – but you also want to put food on it! He produces a wide range of wood-fired terracotta garden planters, decorative pots and slipware, zinc fumed wall discs, and delightful garden installations which he calls “garden punctuations”. installations. Victoria Garland, who has exhibited widely around the region, including at Frome’s Black Swan Arts, and at the St Barbe museum and gallery at Lymington, has been concentrating for some years on the intaglio process of etching on steel-plates and occasionally copper. Posted in Private View on 6 November, 2018 .